"Gelato" is the Italian word for "ice cream". However, anyone who has visited Italy and tasted true Italian gelato, served at one of many gelaterie around the country, know that there is something special and unique about this creamy, cold dessert that makes it different from your traditional "ice creams" elsewhere in the world. Italian gelato is typically lower in fat than American-style ice cream, and is made using only the freshest ingredients - indeed, the finest gelaterie sell only gelato made fresh that day! If you've never had the chance to try Italian gelato before, or want to learn how to make it yourself at home, read on to learn more about this delicious ice cream treat. I'll be sharing with you some of the "secrets" of making gelato, a recommendation for the best home gelato machine you can buy, and also tips on finding the best gelato in your travels around Italy...and elsewhere around the world! Image above: Gelato flavors on display in a shop in Florence, Italy. Photo by the author, sockii. Gelato comes from the Italian verb gelare, meaning "to freeze", so in Italy the term is typically used to describe all kinds of frozen desserts. Primarily the terms gelati (plural) or gelato (singular) refer to milk-based frozen "ice creams"; sorbetti (sorbet) contains no milk but pureed fruit and juice; granite is a coarse ice-and-fruit based offering typically enjoyed in a glass. Gelato can be mixed with whipped cream for a "partly cold" dessert known as semifreddo, or layered in cakes with fruit, nuts and cookies for specialty holiday desserts. Why is gelato different from American ice cream? Gelato is typically prepared in small batches to be consumed the day of production, without the use of stabilizers, emulsifying agents or chemical preservatives (gelato texture degrades rapidly if hard-frozen too long). It is lighter in texture and flavor than American ice cream, generally made with no more than 6-7% butterfat (American ice cream is generally around 14%). Gelato does tend to have a higher sugar content, in the 16-24% range versus 12 to 16% for U.S. ice cream. 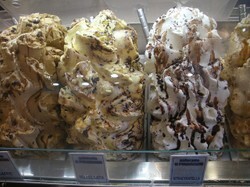 Gelato recipes vary quite a bit throughout the different regions of Italy as well. In the south of Italy and Sicily, vegetable starch may be added instead of eggs, along with cheese, to thicken the mixture. Central Italy specializes in a custard-style gelato made with a milk and egg base. In Northern Italy, heavy cream is preferred to make an even richer base for the custard. No matter which proportion of milk, eggs, cream and sugar is used, the gelato mixture is churned during freezing to result in a light, smooth and airy texture. Served at a higher temperature than hard-frozen ice cream, the flavors of fresh gelato burst onto your taste buds, not so numbed by the cold as in our American version. One can easily learn to make gelato at home with just basic, simple ingredients - and a quality gelato machine. Gelato should be made with seasonally appropriate ingredients and can include savory spice notes (like sage or rosemary) as well as sweet fruit, sugar and chocolates. Spirits can be added to gelato as well for an adult treat, although they must be used sparingly as the alcohol content makes it difficult for the gelato to even partially freeze. Gelato in Milan, Italy. How to choose a flavor? Have you had authentic Italian gelato before? I've had it, but I don't get the "hype" about it. If you are fortunate enough to be traveling to Italy, then you absolutely must visit an authentic gelateria and sample the many wonderful flavors available. Indeed, do not be surprised to become so addicted to the taste of fresh gelato in Italy that you crave it at all hours of the day: morning, noon and night! On a hot summer day, nothing is better for breakfast than a cool cup of gelato and an espresso to beat the heat. And in the evening, sit by a fountain with your gelato and enjoy the sights and sounds around you.When you enter an authentic gelateria, typically there will be a large case with all of the day's gelato on colorful display. Image above: Gelateria Artigianale photo by Michiel Jelijs on Flickr, licensed under Creative Commons Attribution 2.0 Generic. In the 16th century, Florentine architect Bernardo Buontalenti built an ice cave at the Boboli Palace where he served gelati at Medici family banquets. The egg-rich gelato flavor Buontalenti is named after him today in tribute to his inventing the first gelato churned over salt and ice. Do you want to make gelateria-quality gelato at home? Then the Lello 4080 Musso Lussino is the model you want. Yes, it is expensive. But yes, it is absolutely worth it. This is the gelato machine I have in my own kitchen. 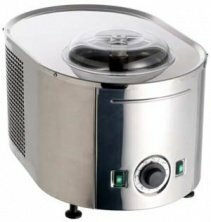 It is heavy duty and so easy to operate - just start the "chill" cycle about 30 minutes before you add your ingredients, then add them and start churning. No need to chill a bowl in advance or worry about the ice cream being over-churned - it will automatically shut off if the mixture becomes too thick. Operation only requires two buttons - chill and churn - with a timer so you can "set it and forget it". The capacity is enough for a small family or couple and cleaning is super-simple, simply wiping clean the top bowl and removable blade and cover. Read the reviews on Amazon and you'll see that for the serious gelato enthusiast, this machine means business. The Lello 4080 Musso Lussino has a 1-1/2-quart capacity and generally takes about a half-hour to freeze a gelato mixture to ideal consistency (may vary based on ingredients used.) The housing, bowl and paddle are all made of stainless steel which makes it easy to clean; the solid construction means it will last for many years. Comes with an instruction manual and recipe guide for basic gelatos you can make at home but can also be used for many other frozen desserts. Since I live in New Jersey, we have an abundance of fresh Jersey fruit every summer. This recipe showcases one of our state's finest fruit crops, the blueberry. It is adapted from a Raspberry Gelato recipe found in the "Italian Ice Cream" cookbook listed below, and is just a sample of the many wonderful things you can do with gelato, fruit and whatever other ingredients you desire! Wash blueberries and puree in a blender or food processor, along with 1/4 cup of the sugar and the water. You may press through a fine strainer to remove the seeds if you wish. Combine milk, heavy cream, and remaining sugar in a heavy saucepan and cook over low heat, stirring, until sugar is dissolved and the mixture just comes to a boil. Place saucepan in ice bath and cool. Meanwhile, start chilling your ice cream maker - approximately 20 minutes should make sure both are at the proper temperature. Combine blueberry puree and milk mixture. Pour into ice cream maker and freeze as per manufacturer directions. This may take between 30 minutes - 45 minutes depending on your equipment and temperature conditions. Serve once thoroughly frozen, topped with the remaining fresh blueberries. I'd love to try real gelato - maybe I'll try to make some.